I became a big fan of the designer Edith Head years ago while researching fashions for my dolls. I bought the DVD "To Catch a Thief" and one of its extra features was "Edith Head and the Paramount Years". There were several short clips from the fashion show in the film "Lucy Gallant". It became my mission in life to get my hands on that movie. Unfortunately, "Lucy Gallant" has never been released on video or DVD. After many months of searching, I was able to buy a copy of the film on DVD. I was so excited! 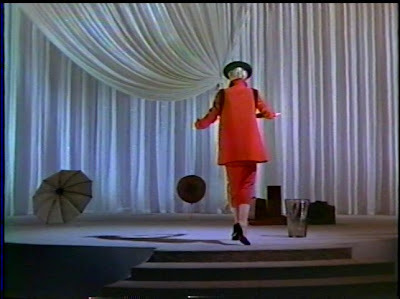 The story in the movie is OK, but the fashions are wonderful. Not long after that, there was a convention for Gene based on that film. I didn't get to go to the convention, but I recognized the fashions from the convention immediately. I was bummed that I had been beaten to the punch again (It happens to me all the time). 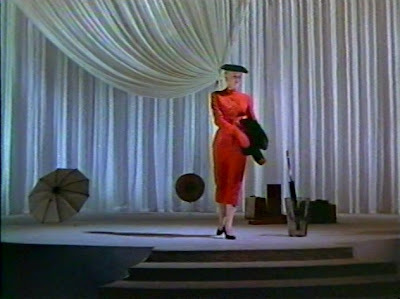 One of my favorite fashions from the movie, besides the red and white gown and coat, was a red suit and coat ensemble in the fashion show at the end of the movie. I have been planning on making this outfit for years and I finally did it. The suit and sleeveless coat are made of wool. I love the fur trim around the armholes. The biggest challenge was finding the fur for the outfit. In the movie, Edith Head describes the fur as sealskin, I knew I need to find the flattest fur I could, to have the same effect. The real coat was completely lined in fur. I tried that in my little doll coat and I felt it was too bulky. I decided to only use the fur on the collar, armholes and down the front of the coat. It would have been great if I could have made it like the real coat, because then it would have been reversible. The fur around the armholes is a little thicker than I originally wanted it to be, but there was a bulk issue again. I am still pleased with the results. My new "It's a Cinch" makes a wonderful model. I love her! I even made faux umbrellas out of wooden shish kebab skewers, beads, fabric, interfacing, glue, ribbon, and a black sharpy pen.